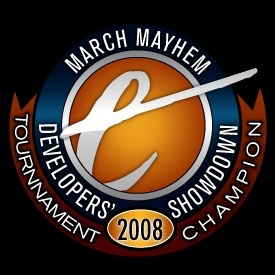 The Escapist is proud to present awards to our four March Mayhem: Developers' Tournament division champions, as well as a special award to Turbine, the tournament winner this year! Turbine leveraged its huge community to get out the vote, and wrapped up the final game by a huge margin. Developers defeated: Harmonix, Bethesda, BioWare, Capcom, Gas Powered Games, ArenaNet. Harmonix made it to the finals, thanks to its mega-hits Rock Band and Guitar Hero. Developers defeated: Epic, LucasArts, Ensemble, LindenLab. The developers of The Elder Scrolls series and the upcoming Fallout 3 took out the West but ultimately ran into Turbine in the semi-finals. Developers defeated: Firaxis, Crytek, Sony Computer Entertainment of America, Mercury Steam. Valve ran through the East and barely lost in a squeaker against Harmonix in the semis. Developers defeated: DoubleFine, Rare, Namco Bandai, Human Head. Be sure to come back next year for all new seeds and another edition of March Madness: Developers' Tournament!